Italian publisher; born at Bassiano in 1449 or 1450; died at Venice, Feb. 6, 1515. Aldus studied the Latin classics at Rome under the direction of Caspar of Verona and Domizio Galderino, and afterward attended the lectures on Greek literature of Guarini at Ferrara. He became tutor to one of the children of Prince Carpi. With the assistance of Carpi's influential family, Aldus was enabled to execute the project, long cherished by him, of establishing a printing-house; and he began, in 1494, with the publication of Latin and Greek works, to which he prefixed learned introductions of his own. 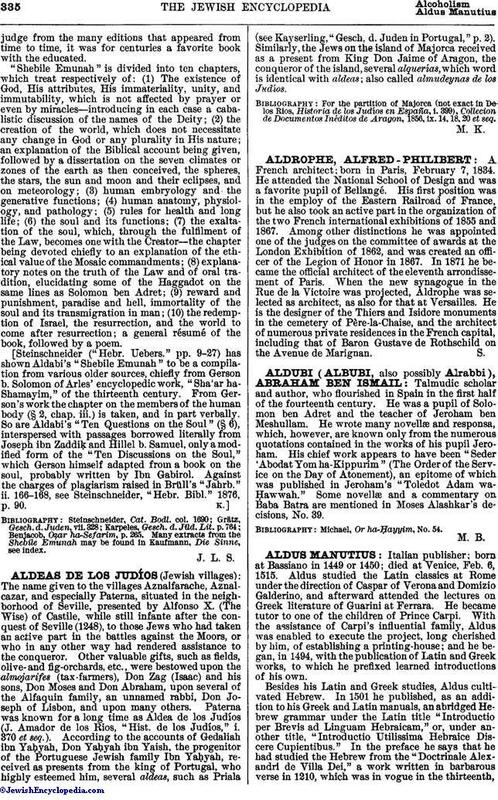 Besides his Latin and Greek studies, Aldus cultivated Hebrew. In 1501 he published, as an addition to his Greek and Latin manuals, an abridged Hebrew grammar under the Latin title "Introductio per Brevis ad Linguam Hebraicam," or, under another title, "Introductio Utilissima Hebraice Discere Cupientibus." In the preface he says that he had studied the Hebrew from the "Doctrinale Alexandri de Villa Dei," a work written in barbarous verse in 1210, which was in vogue in the thirteenth,fourteenth, and fifteenth centuries; but having seen the uselessness of that book, he decided to compose another. Aldus' work was the first printed Hebrew grammar, and was intended for Christian students. 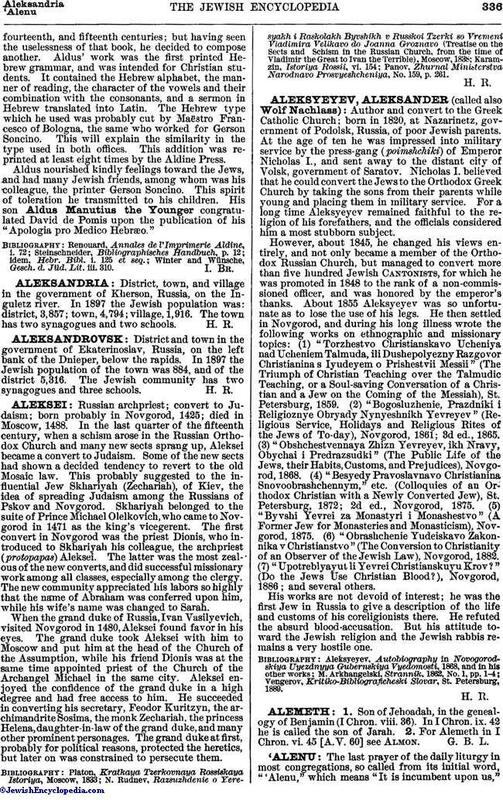 It contained the Hebrew alphabet, the manner of reading, the character of the vowels and their combination with the consonants, and a sermon in Hebrew translated into Latin. The Hebrew type which he used was probably cut by Maëstro Francesco of Bologna, the same who worked for Gerson Soncino. This will explain the similarity in the type used in both offices. This addition was reprinted at least eight times by the Aldine Press. Aldus nourished kindly feelings toward the Jews, and had many Jewish friends, among whom was his colleague, the printer Gerson Soncino. This spirit of toleration he transmitted to his children. His son Aldus Manutius the Younger congratulated David de Pomis upon the publication of his "Apologia pro Medico Hebræo." Winter and Wünsche, Gesch. d. Jüd. Lit. iii. 310.